Hanson is a small Masonic Lodge but with the enthusiasm of the officers for this year, I feel and believe that we will increase in size during 2003. Visitors are welcome at our Lodge. We eat a pot-luck dinner at 6:30 PM and begin our meeting at 7:00 PM on the third Monday of each month. 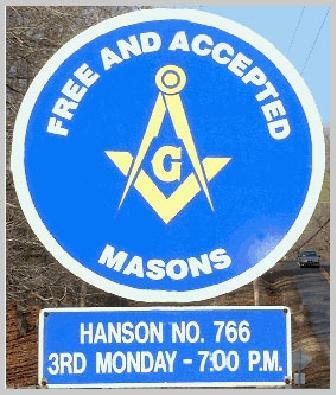 Hanson Lodge is one of the sponsors of the Masonic Family Association in Hopkins County. During year 2001, the Masonic Family Association sponsored a Masonic Day in the City Park of Madisonville and the second Masonic Day in the City Park of Madisonville was held on August 17, 2002 with a parade and a day in the park. During 2002, the Lodge participated in the following parades - Mule Day in Hanson, KY, Veterans Day Parade in Madisonville and the Masonic Family Day Parade in Madisonville.